S.T.A.N.C.E. highlights the importance of diversity in the field of communicative disorders, specifically in the practice of speech-language pathology and audiology. The club is an academic subchapter of CSUF’s gold-accredited NSSLHA and the first student organization in Southern California to represent CSHA's Multicultural and Diversity Branch. S.T.A.N.C.E. provides events, information, volunteer opportunities, and resources related to multiculturalism to aspiring speech-language pathologists and audiologists. During the Spring 2014 CSHA (California Speech-Language-Hearing Association) conference in San Francisco, Sandra Gaskell, the chair of CSHA’s Multicultural and Diversity Awareness Board, encouraged three undergraduate communicative disorders students to form an academic subchapter under CSUF NSSLHA. Sacramento State students had pioneered their own multicultural and diversity awareness subchapter under NSSLHA, and this, along with the growing need for the increased awareness of multiculturalism and diversity, further propelled the creation of S.T.A.N.C.E. (Student Speech Therapists and Audiologists Nurturing Cultural Enrichment). To this day, the executive board members of S.T.A.N.C.E. actively work to bring knowledge and insight to all students in the major of Communicative Disorders; our hope is that everyone eventually finds a stance on all multicultural and diversity awareness issues in our nation. Settled within an eclectic, multicultural university and community, California State University, Fullerton’s S.T.A.N.C.E. highlights the importance of diversity. As an academic subchapter of CSUF’s gold-accredited NSSLHA, S.T.A.N.C.E. provides events, information, and resources to communicative disorders students. S.T.A.N.C.E. facilitates an open forum between community representatives, professionals, and aspiring speech-language pathologists and audiologists to share insights and ideas that will aid students in serving culturally and linguistically diverse populations. S.T.A.N.C.E. not only strives to engage communicative disorders students in their ongoing education, but also encourages students to make connections to various diverse groups, on-campus organizations, and volunteer opportunities within the Fullerton community. The subchapter is working to make great strides in the area of multicultural and diversity awareness through student outreach, community collaboration, and interdisciplinary education. Join us today! HOW TO BECOME A MEMBER OF S.T.A.N.C.E. Thank you for your interest! 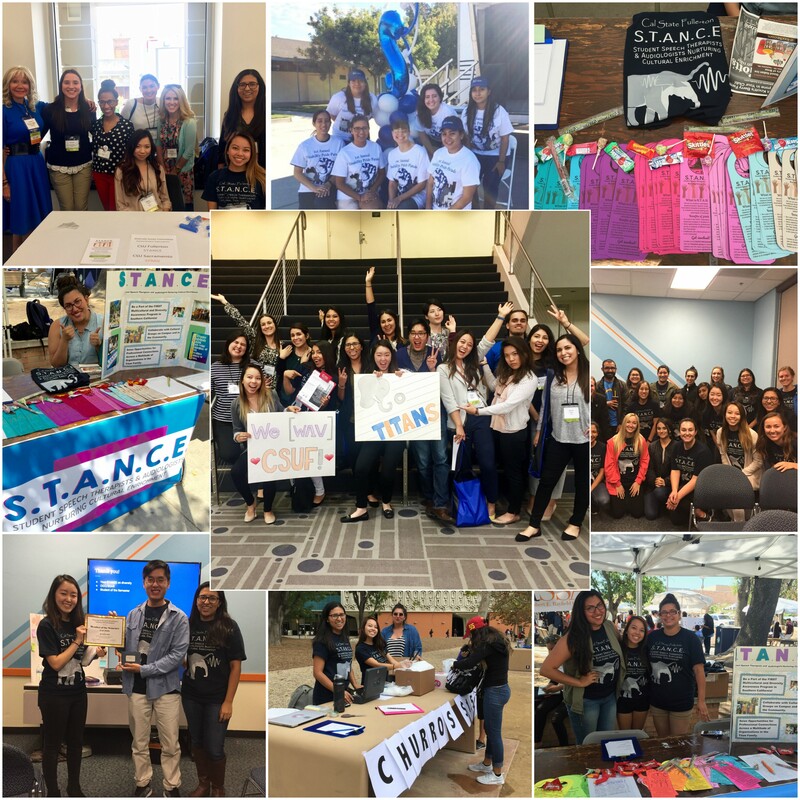 Contact csufstance@gmail.com to get more information about how to get involved in S.T.A.N.C.E.